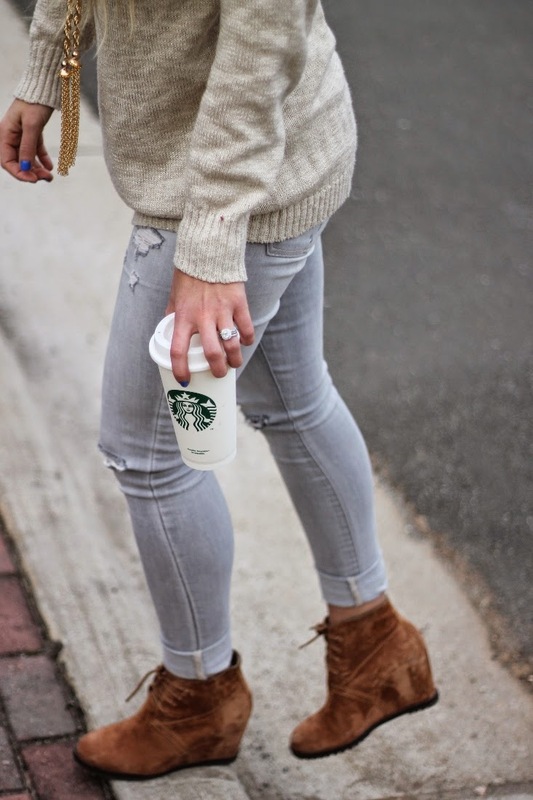 These days my daily uniform has consisted of skinny jeans, oversize sweaters and ankle boots. It's the only thing that is keeping my stylish and warm during these cooler days! Luckily, I've added these gorgeous Trask lace up wedge boots to my collection. They've been a staple ever since I got them! American Eagle Jegging in "Light Grey Destroy"
Sally Hansen nail polish in "Pacific Blue" || Maybelline Vivids Lipstick in "Fuchsia Flash"
These shoes are so incredibly comfy that I don't want to take them off! I'm going to find every excuse to wear them over the next few months. 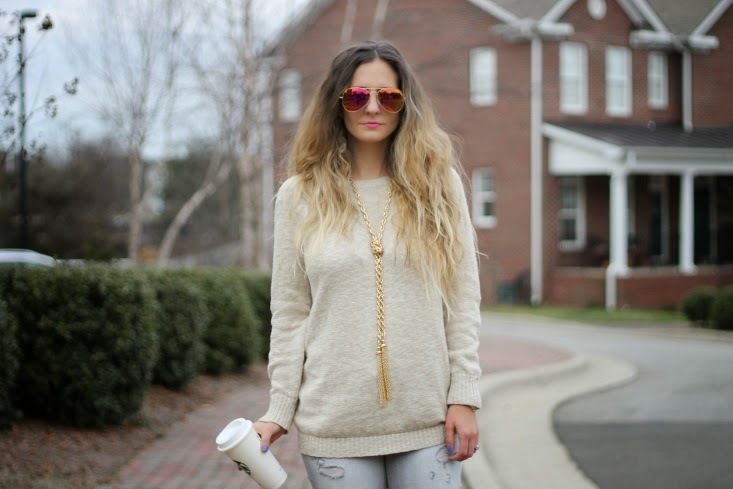 Thankfully they go with everything from jeans to dresses to leggings and sweaters. Thanks to everyone who came out last week to the Fashion Documentary screening and Q&A panel session afterwards! It was SO MUCH fun and a BIG thanks to Deborah for inviting me to be a part of it! I always love speaking to groups and talking about fashion, so it was an overall amazing night. Hopefully there will be events like that to come in 2015. Stay tuned for a mini re-cap and photos. It's kind of hard to believe that my 10 year reunion happened in December. I mean sometimes, high school feels like a zillion years ago. But it just doesn't seem right that it's already been 10 years! And when something as crazy and exciting as a reunion is scheduled in the middle of winter, (ummmm.. yeah.. what??) I kind of freaked out about what to wear. But, as usual The Impeccable Pig & Sole Society came to my rescue! 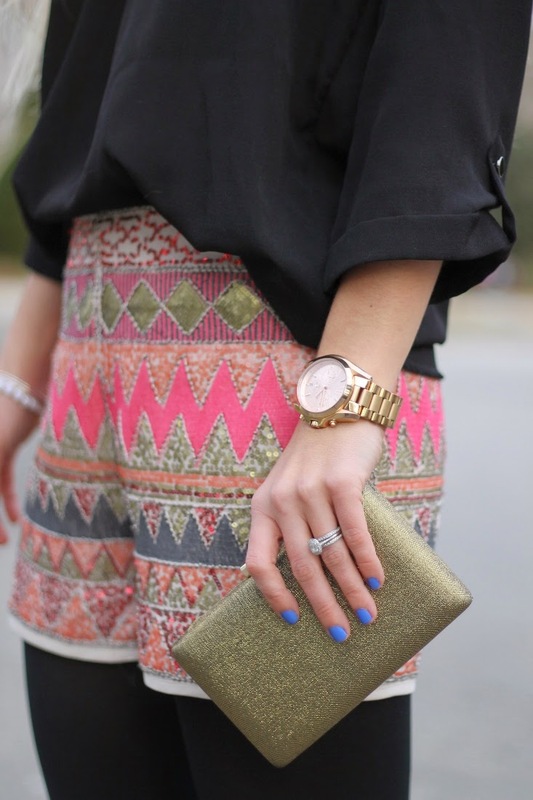 I think the best part of these beaded sequin shorts, is that they can be worn both during the winter and summer. Since it's the middle of December and bare legs usually don't show up until after February, I paired these gorgeous and fun shorts with opaque tights. Kept me warm but my outfit still stayed dressy. In the summer they'll look so good with some strappy sandals and a blousy tank. I seriously can't wait for some warmer temps. I usually base a lot of my purchases on how much wear I can get out of the item. I guess that's what people call.. being an adult? Sole Society continues to create gorgeous shoes season after season. 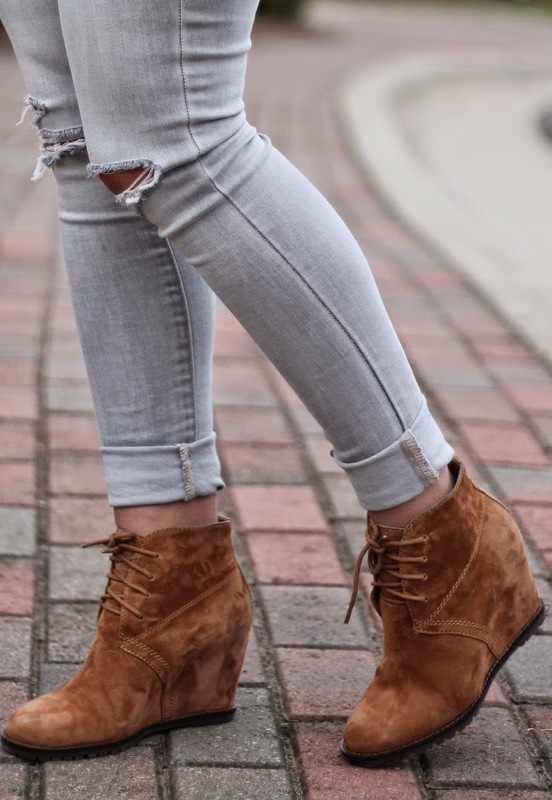 These fringe ankle boots are going to get LOTS of play in my wardrobe rotation. Hello summer concert shoes! And although I've bought mostly bigger bags from them, this gold shimmer clutch is just what my handbag collection needed. I love that it can go from cross body to night out clutch so easily. What's your favorite trick for making 1 piece last through different seasons? Happy Monday everyone! 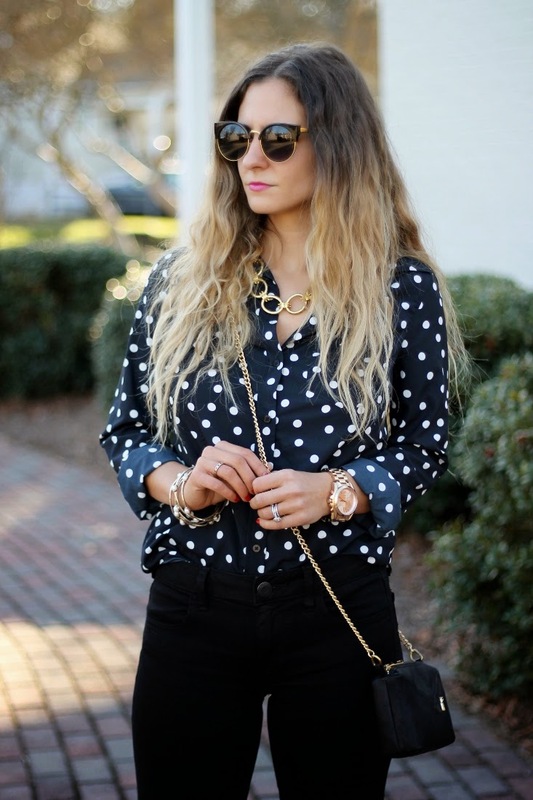 Outfit Post: Black or Navy Polka Dots? So in person, this shirt is black. The tag even said the color was "Ebony." 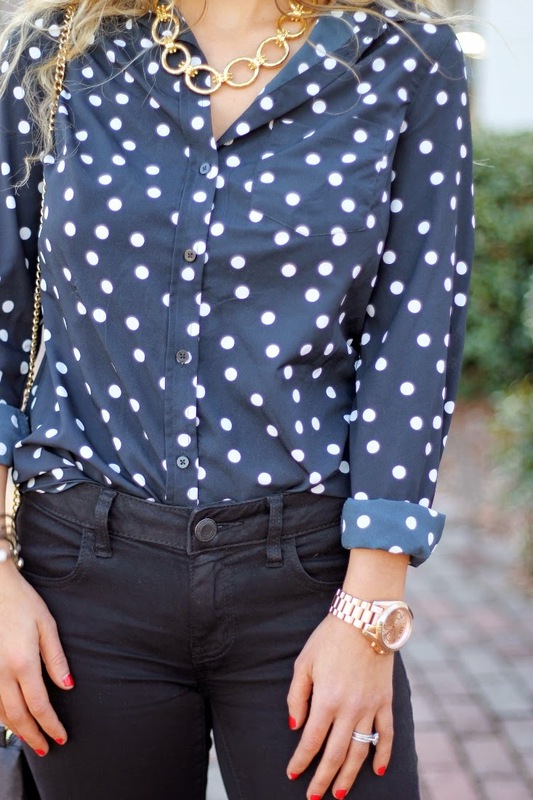 But, after we photographed this outfit, it kind of looks navy. Which I really don't mind all that much since I'm kind of into the black-navy color combination. So let's just pretend I did it on purpose. Maybe you can help me decide if it's black or navy. I wore this a few weeks ago for a double date night with some friends of ours. Sometimes, I just need to wear a black-on-navy black ensemble with my new favorite color: Gold. Okay, so it's not my "new" favorite color, but I'm becoming increasingly obsessed with it. 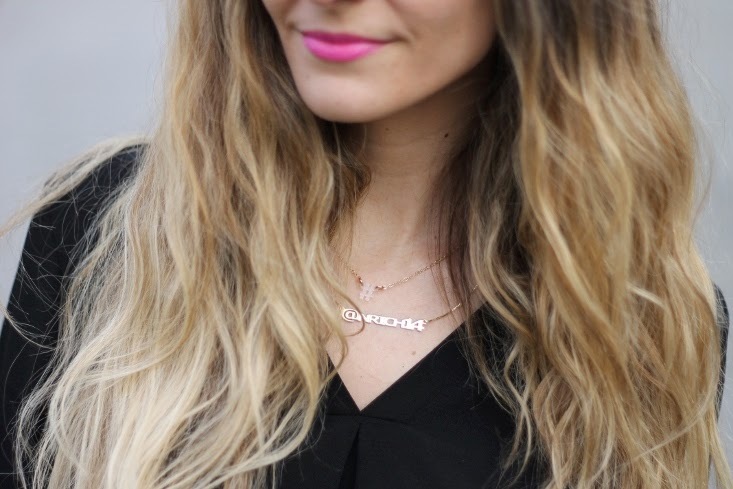 Remember when you were younger, and you were like "I'm only wearing silver jewelry." Well, that was me. And that's the thing I love about fashion. You can totally change your mind. Which I proudly do on the reg. I also have some exciting news for local Raleigh/Durham gals! 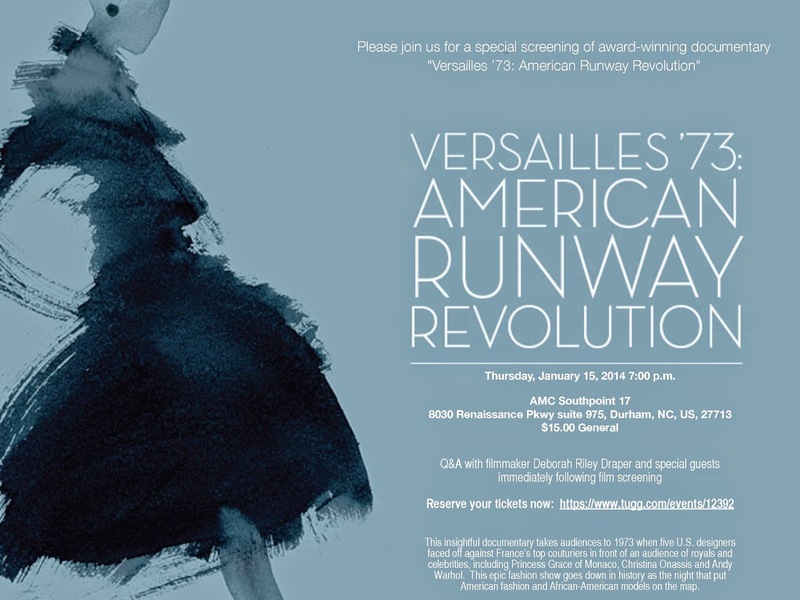 The award winning fashion documentary "Versailles 73: American Runway Revolution" is coming to town for a one night only screening. And I've been asked to participate in a panel discussion afterwards! I would LOVE to see you there. All the details can be found on the below invite or here. Tickets are now on sale and it's the perfect excuse to get dressed up with your friends and have a girls night out!